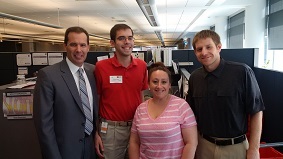 Tyler (red shirt) with (from left) Chick, Ashlee Goodrich (Tyler’s manager) and Scott Barsness (who Tyler job shadowed). Making the decision to help out, lend a hand, become involved, stand up for a cause, become an advocate, has a far-reaching and positive influence on so many lives. For Chick Herbert, a Business Initiatives Senior Manager in our Retail Services business in Des Moines, choosing to volunteer and serve on the board for Special Olympics Iowa (SOIA) the past nine years has been an extremely meaningful and rewarding experience for a number of reasons – specifically, meeting and growing a friendship with Tyler Leech. The Iowa State University Kinesiology and Health Club will once again be an instrumental part of the Special Olympics Iowa State Volleyball Tournament, slated for October 10 at the Forker Building on the ISU campus. Each year, the ISU Kinesiology and Health Club provides invaluable support for the tournament, coordinating the venue and students in the program to volunteer. Registration is due to the state office by Sept. 18. In order to compete in the State Volleyball Tournament, an athlete’s Application for Participation must be valid through Oct. 11, 2015. Please contact Rhonda Schwarzkopf at 515-986-5520 if you have any questions. In an effort to provide souvenir items at more competitions, SOIA staff will be selling t-shirts, polos, shorts, hats and other items at the state volleyball tournament this year. Keep an eye out for souvenir sales at other upcoming events! All proceeds from the souvenir sales go directly to Special Olympics Iowa. 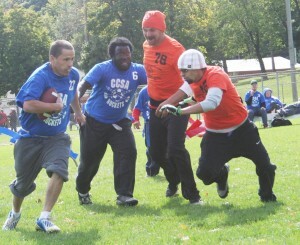 The fifth annual Special Olympics Iowa State Flag Football Tournament will be held Oct. 3 at Ellis Park in Cedar Rapids. Flag football is the newest competition for SOIA, allowing athletes of all ages and ability levels the opportunity to play America’s game. 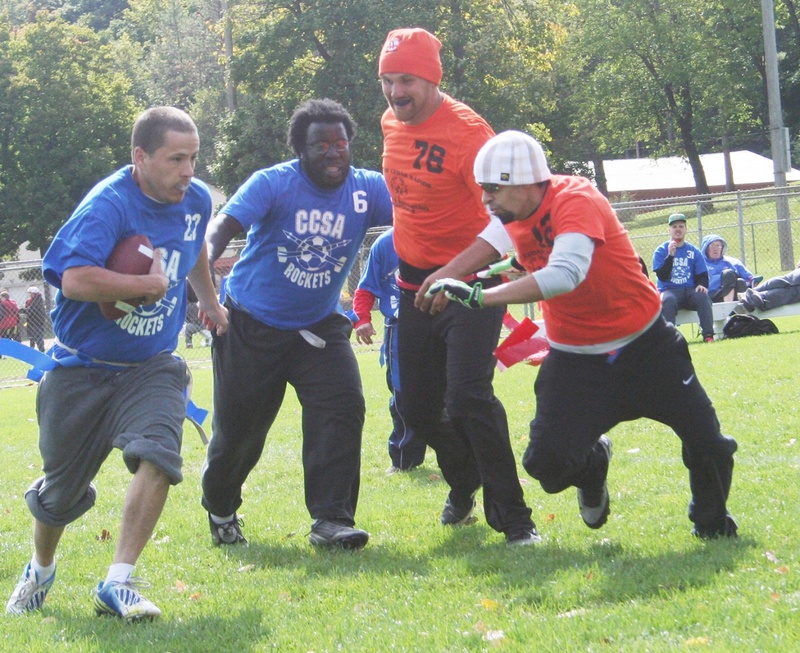 Flag football is a five-on-five, non-contact sport played by both male and female athletes. Teams are divided into divisions based on age and ability level to allow for fair play and competitive competition at each level. Registration is due to the state office by Sept. 11. In order to compete in the State Flag Football Tournament, an athlete’s Application for Participation must be valid through Oct. 4, 2015. Please contact Rhonda Schwarzkopf at 515-986-5520 or rschwarzkopf@soiowa.org if you have any questions. Athlete Physical Form – Any physical other than the Application for Participation in Special Olympics Iowa will not be accepted. This form is specifically designed for Special Olympics. Information listed on this form may not be listed on other forms. If we do receive a different physical (example: school physical) that physical will not be approved and will be returned back to the sender, if possible. 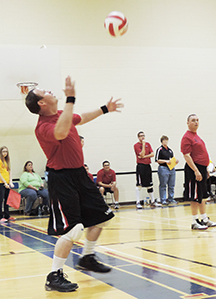 If an athlete is transferring from another Special Olympics state program, we may accept their physical upon review. Athlete Consent – If the athlete is over the age of 18 and is their own legal guardian, they may sign the consent but they must have a witness signature. If the athlete is over the age of 18 and is not their own legal guardian, the legal guardian will need to sign the consent form. If the form is not signed by the legal guardian the physical will not be approved. Verbal Consents – Per Special Olympics North America (SONA), we are required to have written consents only. Effective August 19, 2015, verbal consents will not be accepted. Delegation – Please remember to fill in the delegation at the top of the athlete physical. This helps ensure each athlete is placed with the correct delegation. Completion – Please remember to fill in all information on the athlete physical form. If all parts are filled in correctly, it will speed up the entry process and increase the likeliness of the physical being approved. For legal reasons and for the safety of our athletes we have to follow these guidelines. We apologize for any inconvenience this may cause. If you have any questions, contact the state office at 515-986-5520. Nothing brings fans together like a good old-fashioned tailgate. Tailgate for Teammates will offer a sense of camaraderie, inclusion, and pride among athletes and their supporters. Join us on Oct. 17 from 6-9 p.m. at the State Historical Building in downtown Des Moines. Guests will indulge in upscale tailgate cuisine, take part in fun and festive sports-themed activities, bid for prizes in an auction and cheer for athletes competing in upcoming Special Olympics Iowa events. In addition to company sponsorships, individual tickets will be available for $100. All net proceeds from the event will go directly to the athletes. Your support would be greatly appreciated by our athletes, our fans, and all of us at Special Olympics Iowa striving to create opportunities for inclusion and achievement. For more information on sponsoring the event or to purchase tickets, contact Stuart Steffy at 515-986-5520. 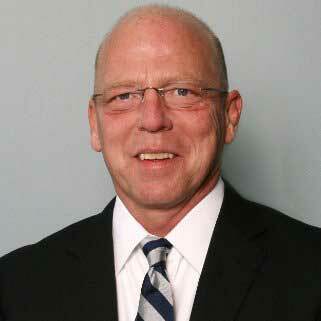 Bruce Wilson has been named Regional Director for the West Region of Special Olympics Iowa. 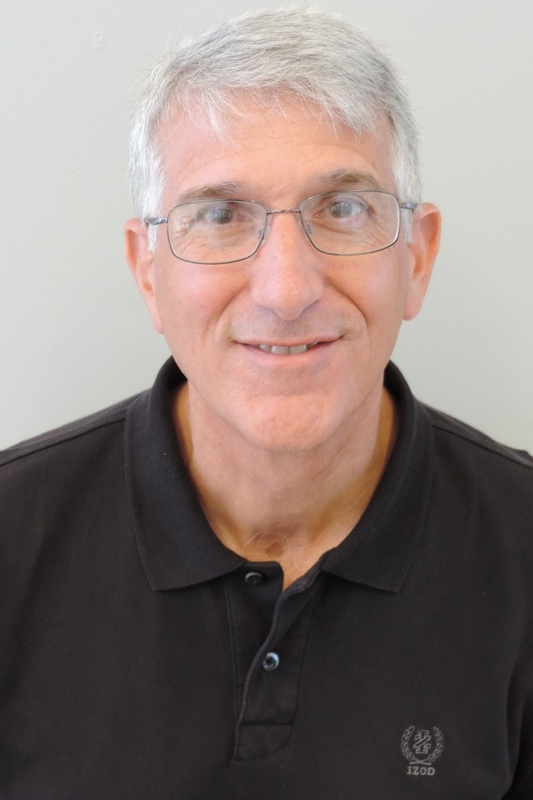 He began his new role in August, overseeing the Northwest, Southwest, South Central and West Central areas of SOIA. Wilson was previously an assistant coach for the Iowa Energy, an NBA development league team, where he coached for five years. He was also the head men’s basketball coach and a professor at Simpson College for 25 years. Wilson got hooked on Special Olympics after volunteering at a cycling event in 1991. He has been a mainstay at the cycling venue at Summer Games ever since. He has also volunteered at the Unified Sports day at Drake University as well as the West Central area Spring Games. 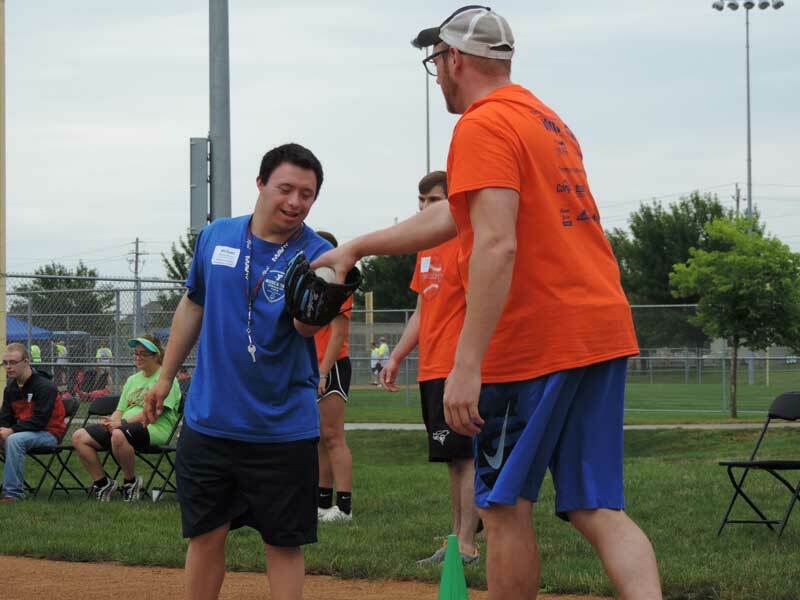 More than 400 athletes competed during the Special Olympics Iowa State Softball Tournament Aug. 8 at the Prairie Ridge Sports Complex in Ankeny. Sammons Financial Group was the Presenting Sponsor for the event, providing more than 80 volunteers including employees, their families and friends. Highlights of the day included a check presentation for $10,000 from Sammons Financial Group to continue its Champion Statewide Partnership and also serve as the Presenting Sponsor of the State Softball Tournament. A new partner of SOIA, Kona Ice, providing spectators and athletes with snow cones as a cool refreshment. They later presented SOIA with a check from the proceeds that day. Though more teams were on the fields this year, the state softball skills competition was the main reason for the increase in athletes at the tournament. 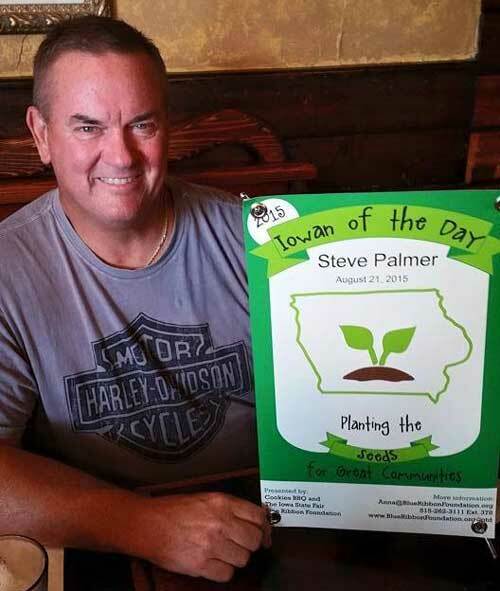 SOIA Board Chair Steve Palmer has been named the Iowan of the Day for the Iowa State Fair on Aug. 21. Palmer was chosen for the honor for his strong work ethic, loyalty to helping others, and an exceptional sense of Iowa pride. Palmer will be recognized on the Bill Riley stage at approximately 2:15 p.m. Aug. 21. Come out and join us in congratulating him! John Arnold has been named the vice president of program services and athlete experiences for Special Olympics Iowa. He began his new role in August. Arnold was previously the president of Midwest Insurance Corporation in Nevada, Iowa. He also spent seven years with Junior Achievement, two as vice president of districts in Central Iowa and five as president of the OKI Partners, located in the Cincinnati, Ohio, area. At Junior Achievement, Arnold was responsible for fundraising, volunteer recruitment, budget and regulatory requirements. Arnold has been a volunteer for Special Olympics since 1989 and served as a board member in 2014. Mercedes-Benz of Des Moines has provided SOIA with a brand new 2015 Sprinter cargo van. 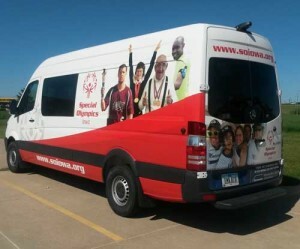 This valued partnership not only allows Special Olympics Iowa to upgrade our aging vehicle fleet but provides us with a mobile billboard to enhance Special Olympics awareness across the state of Iowa.